I have completed transcription of three major street renaming events in early 1900s Seattle: West Seattle; Beacon Hill and the Rainier Valley; and Georgetown. These three tables were created from city ordinances. All of the tables are available for free use on figshare. Here is West Seattle, from 1907. This was in Ordinance 17214. This was already scanned to pdf on the City Clerk’s site. I transcribed and tablified it. Update 2015/12/23: 34 streets in West Seattle were also modified in ordinance 17206 later in 1907. I have added that to figshare. They changed things like Willow to Frontenac, Alki to Stevens, Gowan to Trenton. Here are Beacon Hill and the Rainier Valley, from the same day in 1907. This was in Ordinance 17213. I requested this be scanned, then transcribed and tablified it. I just noticed that I still owe $4 for the scan fee. I should pay that off. If you find value in this, then look for an opportunity to buy me a coffee or beer or something okay? Update 2015/12/23: 20 streets were renamed in Columbia City, South Park and South Seattle later in 1907. That’s on figshare too. It’s includes changes like Darrow to Dawson, Genesse to Genesee. Here is Georgetown, from 1910. Rather than referring to Ordinance 24173 itself, I pulled this from a newspaper article about residents struggling to understand where voting booths were located due to new street names. This was in the Seattle Times, Aug 11 1910, page 3 “Georgetown Folk do Street Guessing Act”. Many street names, like Morgan Street, were newly created in 1907 and replaced a series of street names across a number of plats, from Puget Sound to Lake Washington. 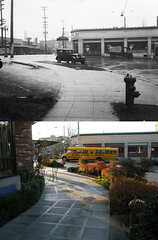 Next to Columbia City was originally platted by Guy Phinney as Maynard’s Lake Washington Addition. In 1907 its streets were renamed to dull things like “42nd Ave S”. Previously they were named after greats of English literature: Milton, Irving, Bulwer, Goldsmith, Abbott, Paine, Bryant, Whittier, Holmes, Tennyson, Moore, Burns, Scott, Pope, and Poe streets. Alamo Place South near Jefferson Park should be named Alama Place South due to a typo in ordinance 17213 that has never been corrected. My end goal here is to translate the locations of each structure built in 1890 into something understandable today. My friend Curt and I created an index of all of the 1890 buildings, which we wrapped up in February. I proceeded in March to correct and tablify the already-transcribed 1895 Ordinance 4044, which rationalized street names within the city limits to that point. I thought this would be sufficient but discovered that it only covered a minority of the street name changes between 1890 and now. A week later I completed an all new index of Ballard street renames, created by painstakingly reviewing maps from before and after the 1907 annexation. I later discovered that ordinances renamed each part of the city at the time of annexation. Street names are always changing, so I may need to do some data gathering of more sparse resources to finish my overall project. I’m looking forward to it.